Church Pew - can it be saved? 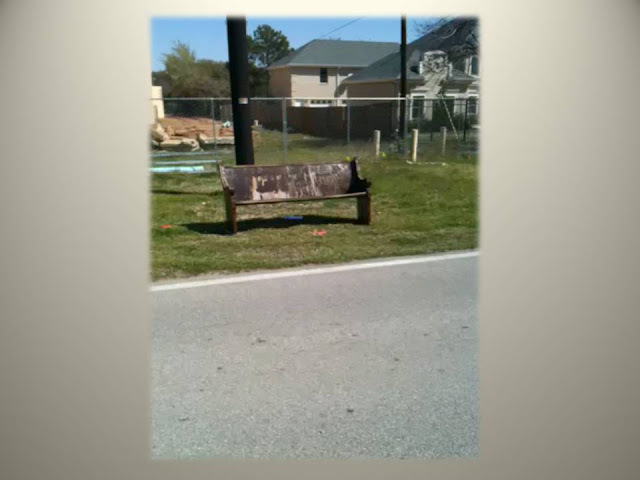 I have a wonderful friend that called me up to let me know that there was a church that was being demolished in the area and they had left a pew on the side of the road for anyone to pick up. She knows me well and knew that I'm always looking for "treasures." Of course, I get a call like this and I can't ignore it, even if I'm still in my PJ's! I immediately got dressed and jumped in my car and headed out on my inquiry about this treasure. I pulled up next to the pew and my first impression made me thrilled. Yes, it definitely needed to be "born again." It had some major problems. It was rugged and worn, tattered and definitely abused. How many have sat in this pew? What memories were created from weddings? Who mourned over their loved one at a funeral? Whose life was changed forever? What kid fidgeted and drove their parents crazy? Who watched their friend or family member's baptism? Who grew older and grayer over the years? What worries in life were brought before God? How many words of thanks were uplifted? How many actually fell asleep in this pew? What hymns echoed throughout the building? How many children got pinched because they weren't listening? How many hearts were touched by another sitting next to them? Who held hands with someone they loved? How many generations sat in the same pew each Sunday? These are just a few of the questions I asked myself. These are also the things that made this pew a treasure!! I love old things that have history! Who doesn't? 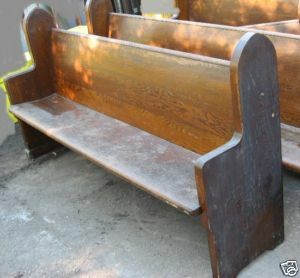 Craig's List Church Pew - $300 and it isn't even restored. I would pass up on this treasure. down to see what they were going to do. Oh no, did I make the wrong decision? This is a treasure and now someone else is going to take it away!! I slowed down and watched anxiously. The couple walked around it several times, stood there and talked with their hands on their hips. The man (I'm assuming he was the husband) didn't look too enthuised. Of course, I knew why! Finally, I could tell that they had made a decision and started to pick this treasure up. I started wondering why I passed this opportunity up. I don't like seeing others take away "my" treasure. They both grabbed a side and started to walk toward their truck which was all prepared for loading. Suddenly, within a few seconds, the pew started to fall apart and eventually it fell into a pile in front of them. They both looked so disappointed and walked away. But he said to me, "My grace is all you need. My power is strongest when you are weak." Not every thing is a treasure! What it did remind me as I drove home is that people are ALWAYS treasures. We sometimes look like we are okay and put on a false pretense that "all is great" but we all fall apart at times too. The great thing is that we are always a treasure to others, always. Sometimes we look ragged, worn and often we feel like we can't ever be put together again. However, if we surround ourselves with people that love us, they can pick us up, load us up with encouraging words, wisdom and love and they don't just leave us there like this couple left this pew. Our friends and family begin to put us together with Gods help of course! Thank you Peggy for calling me about this treasure, it was a great reminder for this Easter weekend about restoration and the need for God's help! 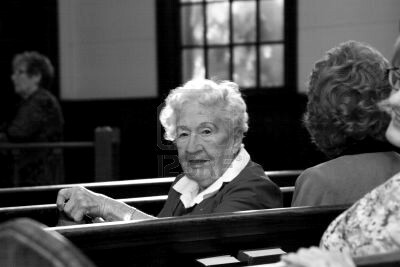 I'd love to hear your comments about your memories in your church pews growing up? Have hope my friends, you are a treasure!